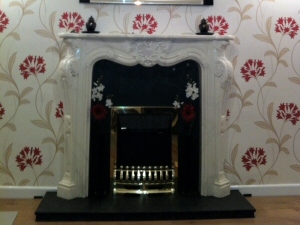 Decorative fireplace, wall-papering and laminate flooring for a Penwortham propertyWe pride ourselves on a job well done, with much of our work coming from word of mouth referrals. "Sue and Steve have worked very hard and I would have no hesitation recommending them to anyone. In fact, we sometimes had to remind Steve about going home. Our thanks to both of you." "Having moved into a new home, we encountered an above average number of maintenance jobs to be put right within the property. We asked KSW to quote for each of the jobs separately and were happy with the price and very impressed with Steve and Susan's friendly approach. They prioritised the urgent work, squeezing it into their busy schedule and came back later for the general maintenance tasks. Steve's meticulous attention to detail and high standard of workmanship are a credit to him and we would have no hesitation in recommending KSW to others." "Steve has decorated six rooms over the past few weeks and each has been done to the highest standard that you could expect. His work is faultless, requires no further cleaning and is quickly completed. He will be recommended by us to anyone who needs his services." "We'd just like to say how grateful we are for all your hard work and efforts to make such a wonderful job of the decoration of our lounge, hall, stairs and landing. We're so pleased with the final result. It's made such a difference; in fact we'd go as far as saying it's startling. It's reassuring to know that when you trust someone to do a job for you, they carry out your wishes and produce such a fine result it gives you complete trust and satisfaction. You know each time you request some work to be carried out it will always be completed properly and with absolute professionalism." "Just to drop a line to offer recommendations for the work carried out on the apartment. The renovation project went to clockwork with the work completed within the time frame given. The work was to an extremely high standard. The couple worked very hard to put my rental back to a habitable condition. They were very honest about the work that needed to be done and what could be achieved, which saved thousands. The flat looks great and I would have no hesitation in recommendeding them." KSW Services offer a quality service for a reasonable price. Take a look at our About Us page for details.